Wedding planner/dress designer Kelly knows the perfect thing that will top off the wedding dress she is going to make for Natalie to wear when she marries Damion. The only problem is that the old shawl that she would like to use now belongs to Mary and Mary is unwilling for it to be used by anyone but the original owner. Finley and Amos have still not found each other, but Mary is hoping that someday the magic of the shawl will be reunited with Finley and she and Amos will finally be reunited. But in the midst of renovations to Mary's house, in preparation for Damion and Natalie's wedding, the shawl has gone missing. This is a tragedy for the townsfolk of Finley. Kelly is a skeptic when it comes to the legend of Amos and Finley, but she knows how important the shawl is to Mary and so she visits Amos's statue to enlist his help in finding the shawl. Amos helps Kelly in another way though that is true to what he is known for, helping people find themselves. 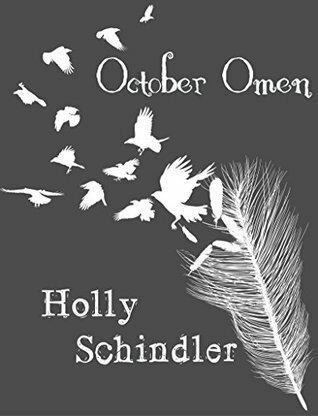 I enjoyed October Omen! Not only was there more of the legend of Amos and Finley, but there was also a bit of Indian legends, omens(good and bad), and the love that one town has for helping out their fellow neighbor in need. I love how each installment can stand alone, yet as a whole the story is building and I can't wait to see what happens next! Miles Left Yet where the town of Finley is introduced.